There are over 200 million households in Europe whose combined domestic heating needs account for around 30% of Europe’s energy demand. Reducing this will be essential if Europe is to achieve ambitious emission reduction targets (i.e. 2020 targets) and decrease our excessive reliance on imported energy. The clear solution to these two problems is to increase the amount of renewable energy used, an ambition at the heart of much recent EU legislation, of which new Heat Pump systems are a key enabling technology. Despite the recent success of the European heat pump industry there are still several major challenges to overcome and opportunities that need to be exploited if recent market volatility is to be overcome. Despite significant incremental technological progress (i.e. compressor technology, refrigerants, valves), heat pumps still command a price premium compared to modern condensing boilers. If no subsidies are available, this means that a heat pump (when competing directly with gas) must significantly outperform gas based alternatives, which is difficult as the gas price typically ranges at 1/3 of the price of electricity per kWh. Furthermore, compared to ground source heat pumps, little changes have been made to the conventional finned tube heat exchangers used in air source heat pumps. The latter have much wider applicability on a European scale. 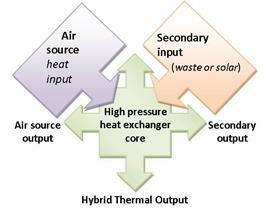 The emergence of other renewable energy technologies such as solar thermal or solar electric systems has led to significant research in the field of hybrid systems. For solar PV systems no physical integration is required. With regards to solar thermal systems a significant opportunity exists to combine them with heat pump systems to increase their combined seasonal performance. Despite the R&D being performed in this field there are virtually no affordable hybrid solutions available in the market place. The main reason for this is the increased complexity that is introduced when choosing for physical integration which requires a heat exchanger that is capable of capturing energy from air and a liquid (i.e. solar system’s glycol heat transfer media). Investigating a range of diverse possible components like aluminium, copper and ceramic in order to reduce the weight and improve the heat transfer and reduce thermal losses accordingly. The development of a new and advanced joining process known as diffusion bonding. Diffusion bonding is a solid-state joining process capable of joining a wide range of material combinations. The bond achieved in this way will have the same physical, chemical and mechanical properties as the base material. Therefore, diffusion bonding will enable us to seamlessly join multiple materials into a single piece design, to reduce the overall manufacturing cost and maximise heat transfer. In order to cost effectively achieve very complex and high precision designs with multiple fluid channels and excellent thermal conductivity, components may be built up in layers (laminations) before joining. This advanced process is dependent on a number of parameters; in particular, time, applied pressure, bonding temperature and method of heat application which will form one of the core research objectives in this project. A major hurdle to wider implementation of diffusion bonding is that in current form it is not suitable for high volume manufacturing environments. With renewX we aim to develop a diffusion bonding process suitable for medium to high manufacturing environments.